Private Parker's Story: Like other enlistedmen of the 44th Massachusetts, Private Steven Henry Parker went to war with every expectation of coming home unscathed by the ravages of war. He was young, wealthy and adventurous. He was blond, blue eyed and had a fair completion. At the age of 18 he enlisted in Company I of the 44th on August 26, 1862, which was a nine months regiment and were assigned to the Dept. of North Carolina. If you click on this photo you'll notice something peculiar about Pvt. Parker's coat.....it isn't exactly government issue. Far from it in fact, it's a finely tailored and custom made frock coat specially made just for Parker. Being wealthy, Parker (or someone close to him) commissioned a tailor to produce the coat at some point in his enlistment. He survived the Goldsboro Expedition and the 44th was mustered out in June of 1863. 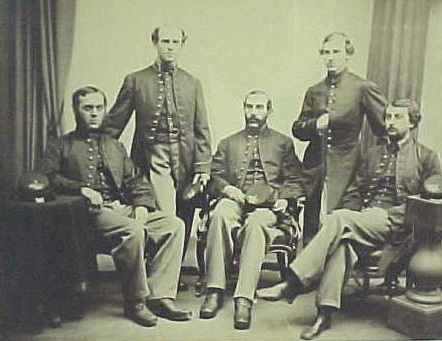 Parker then reenlisted in February 1864 with Company D, of the 59th Massachusetts. They fought in the Wilderness, Spotsylvania, Cold Harbor and Petersburg battles. Company D was heavily involved at the battle of the "Crater" and Parker was mortally wounded, later dying in a field hospital on July 30th, 1864. Parker's story may be like the other 600,000+ casualties who died during the war, except the story doesn't really end there..... Upon his death at the Crater, a friend in another regiment took the coat and wore it until war's end. Upon arriving home in Mass, the friend then gave it back to the Parker family along with other personal items. His family saved the coat and it is in pristine condition today. 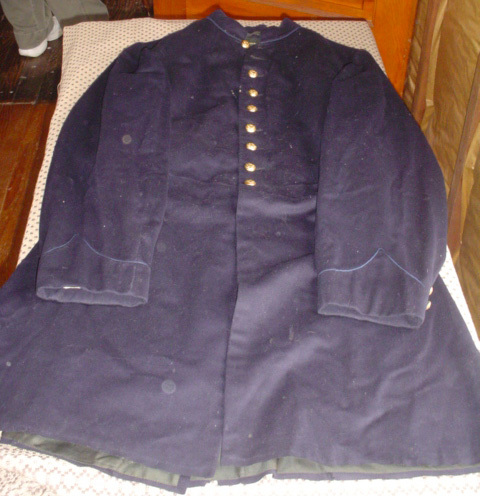 The Details of the Coat: The overall fabric, pattern and construction of the coat is on par w ith of many of the field grade officer coats I've examined. 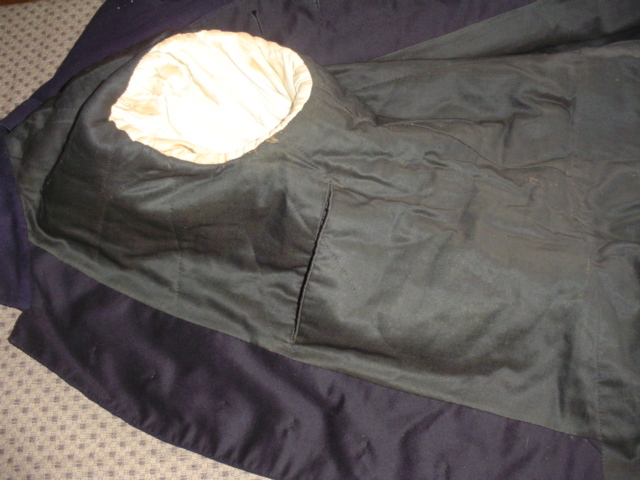 The ballooned sleeve, long and fully lined skirt, hand details and high grade broadcloth indicate that this coat was produced by a tailor rather than a government contactor. 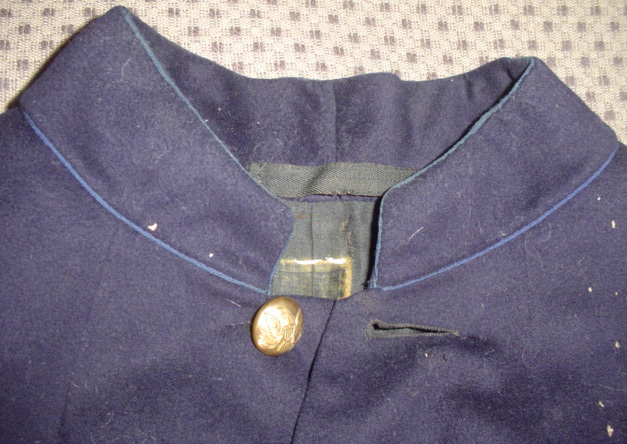 The buttons on the coat, tails and cuffs are all standard eagle buttons. w Parker to wear the coat without disrupting the overall look of his company by not standing out, but still allow him to obtain a better constructed and better fitting coat. 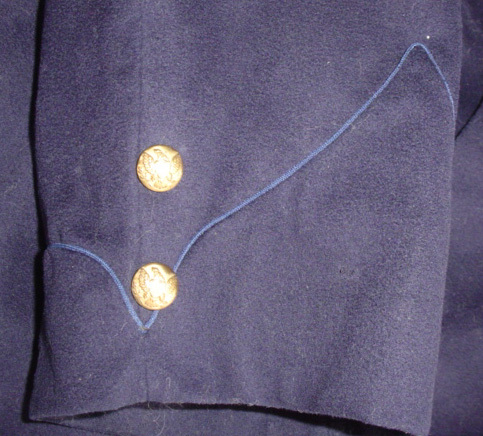 Although the cuff is non-functional, there are still two ornamental cuff buttons on on the out seam of the sleeve. 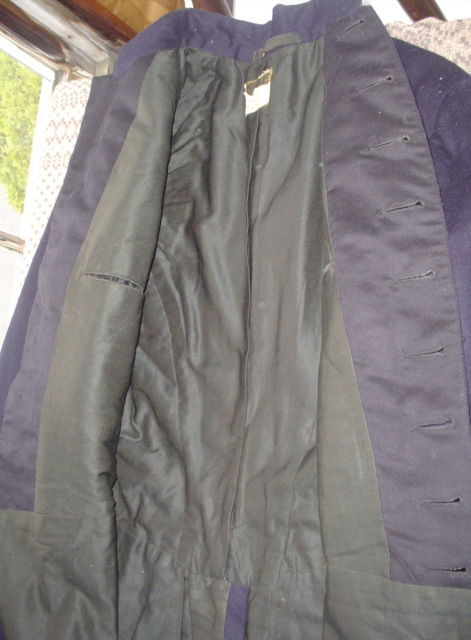 The coat is fully lined in Green polished cotton and is quilted in the chest area. 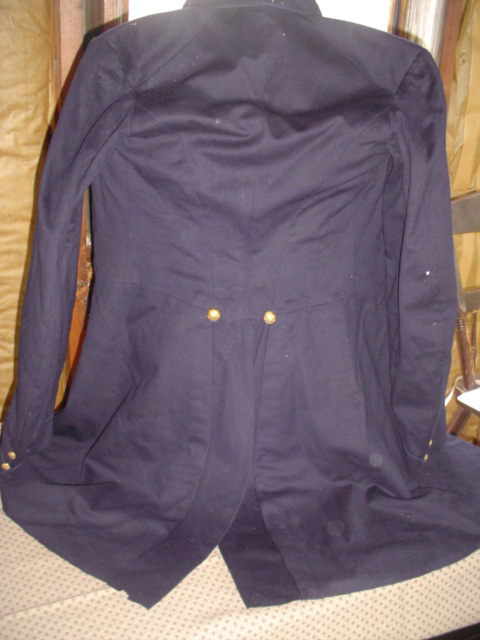 Like the government version, this coat also has two tail pockets accessible from the inside, but it also has two breast pockets which are lacking in the issued coats. 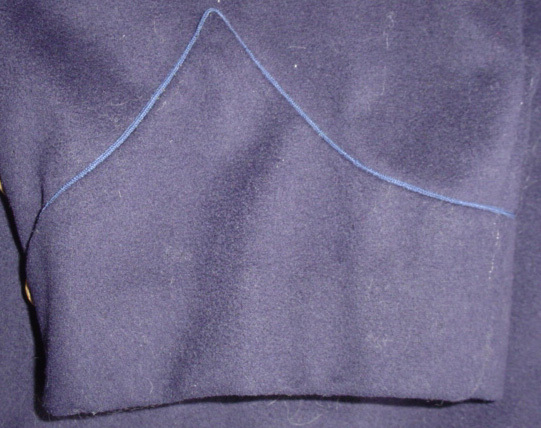 Tail pocket bags and sleeve linings are cut from a white polished cotton.